At Chofetz Chayim, we believe that preparing for Bar Mitzvah & Bat Torah is not just preparation for a specific day or event, but to quote one of our students, "working with Rabbi Becker" is preparation for life itself. In addition to learning text, Hebrew and familiarity with Synagogue life, young people are engaged in one-to-one interactive thinking and development with Rabbi. Integral to this experience is the emphasis Rabbi Becker places on the enhancement of character and personal qualities of the student, without which, religious training is incomplete. "Working with Rabbi Becker did more than just strengthen my connection with G-d, it helped me become a better person... My experience made me proud of my Jewish heritage and allowed me to see the world through a different lens." 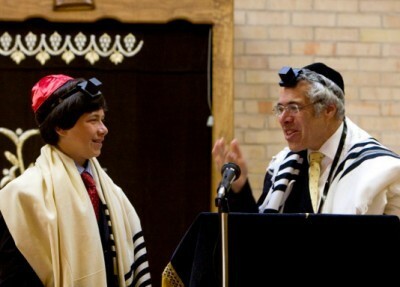 "Because of Rabbi Becker’s enthusiasm for the teachings of the Torah, I saw firsthand just how important Torah study was, and could not have asked for a more meaningful or enjoyable Bar Mitzvah. Rabbi and I developed a strong connection through these personal classes and I now know Rabbi Becker not just as a mentor but as a friend." "I feel that the close bond that you and Zach developed was the key to this wonderful simcha. Your instruction was very personal and warm; you were able to draw out the best in Zach. I am sure that all the preparations surrounding the Bar Mitzvah will be a positive influence in years to come." "........from the morning preparations with the generations of our family, to the moving ceremony, to the burst of emotions during and after. Many in attendance were unfamiliar with an Orthodox ceremony, or with a Bar Mitzvah ceremony at all. We received countless compliments on the depth of warmth and meaning in the service and how well Rabbi spoke of our son and communicated the significance of the occasion."